The Rim Rock trail is located in the South Rim Section of the Black Canyon of the Gunnison National Park near Montrose, Colorado. After the trail receives an adequate amount of snow during the winter months it becomes a popular destination for snowshoeing along with the Uplands and Oak Flats trails as well as the South Rim Cross Country Ski trail. The Rim Rock Nature trail offers spectacular views of the Black Canyon as it travels the rim for nearly a mile between the Visitor Center and the campground. During the winter, between November and April, the road is plowed as far as the South Rim Visitor Center. The Rim Rock trailhead is at the southeast end of the parking area. You can get the current conditions from one of the rangers or staff within the Visitors Center before you head out onto the trail. The trail begins by traveling through a thicket of oakbrush as it parallels the road heading south. Before traveling very far glimpses of the upper walls of the canyon come into view. The north facing cliffs that see very little sun during the winter months are white with snow. Just the opposite is true for south facing cliffs where the black rock absorbs the suns radiant heat. There are a couple of spots where the trail has some exposure and a person could conceivably under certain conditions fall all the way to the canyon below. Whether that has ever happened we haven't heard but families with small children should nevertheless be aware of the exposure and keep their kids in tow. A little more than a quarter mile from the Visitor Center the trail passes just below Tomichi Point where there is another restroom. There were a couple bare spots of ground on the trail the day that we were taking photos for this post. The ranger suggested that we borrow a pair of the ice cleats that they loan to visitors rather than use our snowshoes. The stretches of trail where the snow was deeper were packed down well enough that the cleats were probably the better choice. The rangers inspect the trails regularly and their advice is certainly worth heeding. After passing Tomichi Point the trail continues much as before except that the road gets further and further away. With the road further away the sound from the Gunnison River over a thousand feet below is about all that can be heard other than an occasional bird or a rabbit scurrying through the underbrush. Just past the 3/4 mile point the Rim Rock trail is joined by the Uplands trail. 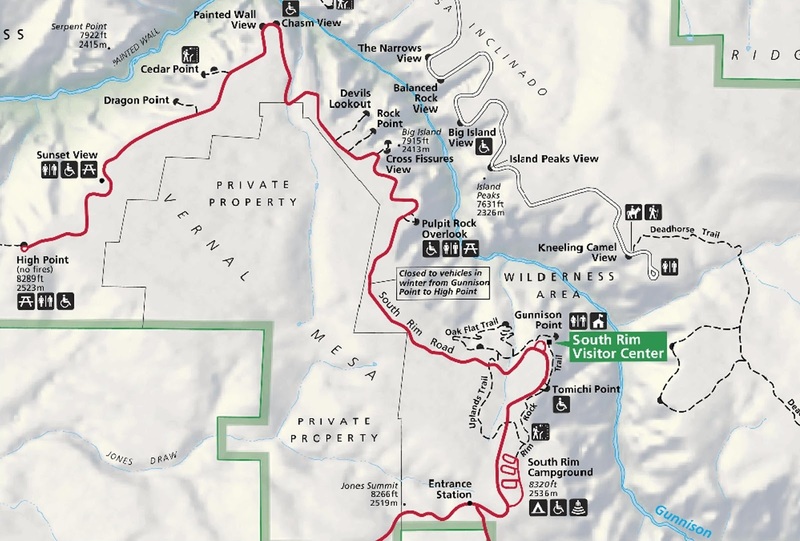 A popular loop for snowshoers during the winter and hikers during the summer is to head out from the Visitor Center on the Uplands trail and return via the Rim Rock trail. Remember though that dogs aren't allowed on the Uplands trail. The trail comes to an end at the campgrounds. The campground has 3 loops with one of them that is even open during the winter. The Visitor Center is open from 9am-4pm during the winter and the restrooms are open 24x7. As far as snowshoeing the Rim Rock trail goes it is a nice wintertime option in the Montrose area. If you would like to see it for yourself then all you have to do is 'Take a hike'.